Redeem Your Groupon! Personalized Kids' Tees! Thomas & Friends has sparked the imagination of young children for generations, delighting them with timeless lessons of discovery, cooperation, and friendship, while helping to foster social-emotional development. All your favorite Thomas & Friends characters - Thomas the Tank Engine, James, Cranky the Crane, Percy, Sir Topham Hat & all the others - are at the official PBS KIDS shop! Here at the Thomas & Friends PBS KIDS shop you can find Thomas the train toys, personalized gifts, and other neat Thomas & Friends merchandise! Looking for Thomas the train clothes? You've come to the right place! We carry a wide variety of Thomas & Friends clothing featuring everyone's favorite steam engine! 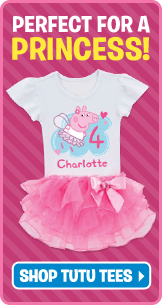 Much of our Thomas the train clothing can be personalized.